"I Have a Rendezvous with Death" by John Quinlan. 11x14". Acrylic on canvas board. Photo © John Quinlan. 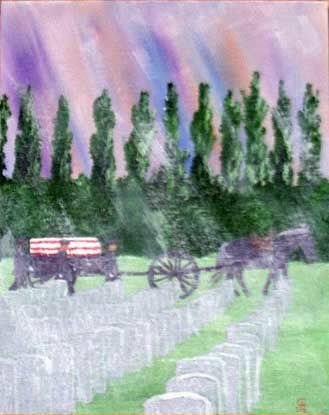 Painted from photos the artist took Arlington National Cemetery, USA. Jumpstart your imagination with these snippets of poetry. I suggest sitting with a sketchbook and doing thumbnails of images that occur to you from each piece, rather than jumping in with paint on canvas with the first. Spend at least 15 to 30 minutes on this, letting one thumbnail lead to another, to another. 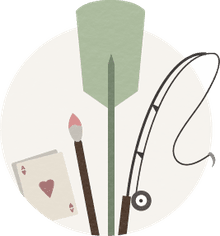 Think about formats (shapes and sizes of canvas), variations on composition, where (and what) the focal point is going to be. Then decide on a final composition and get painting! "My love is like a melody"
"A Door just opened on a street"
"O wild West Wind, thou breath of Autumn’s being"
"White pigeons rush at the sun"
"I wandered lonely as a cloud / That floats on high o’er vales and hills"
"I was ... not waving"
"The ghosts the living would prefer"
"The long day of the year is almost done, / And nature in the sunset musing stands"
"Draw no lines there with thine antique pen"
"A woman's face with Nature's own hand painted"
"I would be the pink and silver as I ran along the paths"
"The long road is sleeping"
"My hands are full of blossoms plucked before"
"We all looked like goddesses"
"Here there is no water only rock"
"Stars, in their orbits, Shone pale, thro’ the light"
"An old man upon a winter’s night." "We’ll tak a cup o’ kindness"